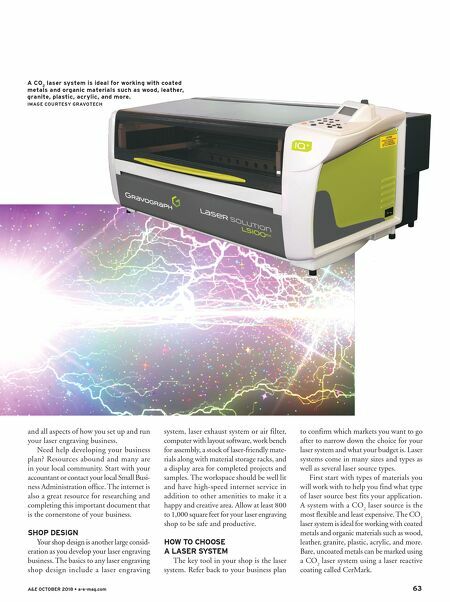 62 a-e-mag.com • A&E OCTOBER 2018 D eveloped a little over 30 years ago, laser engraving systems took the world market by storm. The applications and markets for laser engraving continue to grow at a rapid pace. It is the laser engraving system's ability to create products quickly and cleanly that makes this technology such a workhorse. Using standard graphic layout software is where the process begins. Simply type in text and add graphics to create the laser engraving layout. The user-friendly printing interface prints the layout to the laser along with engraving parameters. Position the item to be custom- ized in the bed of the laser system and press Run to start the transformation. What does it take to get started in the fast-paced market of laser engraving? Read on to find out. GETTING STARTED Getting started in the laser engraving business is easy thanks to the many sup- pliers and trade shows. It is now easier than ever to find laser-friendly materials, laser equipment, and how-to training. 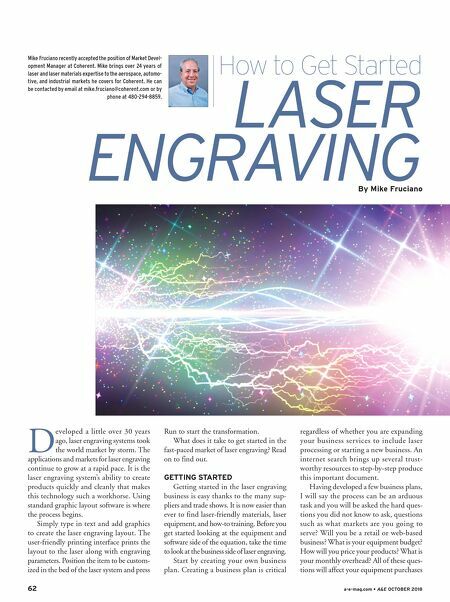 Before you get started looking at the equipment and software side of the equation, take the time to look at the business side of laser engraving. Start by creating your own business plan. Creating a business plan is critical regardless of whether you are expanding your business services to include laser processing or starting a new business. An internet search brings up several trust- worthy resources to step-by-step produce this important document. Having developed a few business plans, I will say the process can be an arduous task and you will be asked the hard ques- tions you did not know to ask, questions such as what markets are you going to serve? Will you be a retail or web-based business? What is your equipment budget? How will you price your products? What is your monthly overhead? All of these ques- tions will affect your equipment purchases By Mike Fruciano How to Get Started LASER ENGRAVING Mike Fruciano recently accepted the position of Market Devel- opment Manager at Coherent. Mike brings over 24 years of laser and laser materials expertise to the aerospace, automo- tive, and industrial markets he covers for Coherent. He can be contacted by email at mike.fruciano@coherent.com or by phone at 480-294-8859.